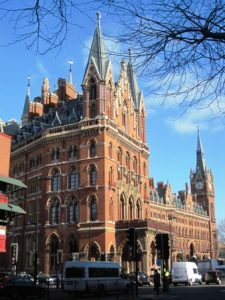 St Pancras is one of the great Victorian train stations built to bring people into London from the estates to the North. The station is fronted by a highly ornate gothic style hotel with a magnificent arched railway “shed” behind. The station is now the terminus for the Eurostar service between London and Paris. The platforms of the national railway services are raised in order to give the train lines sufficient elevation to clear the Grand Union Canal to the north (the Eurostar service enters a tunnel soon after leaving the station). Originally the space under the platforms was used to store barrels of beer but this area now houses shops and cafes. There are restaurants and bars within the station and also one or two notable gastro-pubs in the immediate area, for example the Sommerstown Coffee House on Chalton Street, the Betjeman Arms within the station itself and The Fellow on York Way.